1. An increase in the oxygen-carrying capacity of the blood (hemoglobin). As a result of training, there is an increase in the red blood cell count. Red blood cells contain hemoglobin, which transports oxygen in the blood. 2. 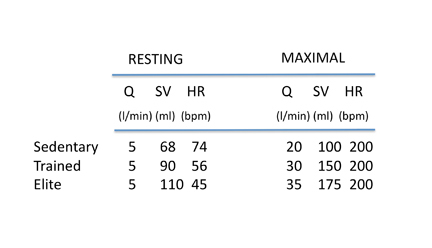 A higher maximal oxygen uptake (Max VO2). The amount of oxygen the body is able to use during physical activity significantly increases. This allows the individual to exercise longer at a higher rate before becoming fatigued. Depending on the initial fitness level, Max VO2 may increase as much as 30 percent, although higher increases have been reported in people with very low initial levels of fitness. 3. A decrease in resting heart rate and an increase in cardiac muscle strength. During resting conditions, the heart ejects between five and six liters of blood per minute (a liter is slightly larger than a quart). This amount of blood, also referred to as cardiac output meets the energy demands in the resting state. Like any other muscle, the heart responds to training by increasing in strength and size. As the heart gets stronger, the muscle can produce a more forceful contraction, which causes a greater ejection of blood with each beat (stroke volume), yielding a decreased heart rate. This reduction in heart rate also allows the heart to rest longer between beats. Average resting and maximal cardiac outputs, stroke volumes and heart rates for sedentary, trained, and highly trained (elite) individuals are shown below. Resting heart rates are frequently decreased by 10 to 20 beats per minute (bpm) after only six to eight weeks of training. A reduction of 20 bpm saves the heart about 10,483,200 beats per year. The average heart beats 70 and 80 bpm. As seen in the table athletes are frequently around 45 bpm. 4. A lower heart rate at given work loads.When compared with untrained individuals a trained person has a lower heart rate response to a given task. This is due to the increased efficiency of the cardiovascular system. Individuals are also surprised to find that following several weeks of training, a given workout (let’s say a 10 minute mile) elicits a much lower heart rate response as compared to the response when training first started.